Please call us or enter your 5-digit ZIP code to check for availability. Thank you for visiting Garage Experts of Southwest Missouri. 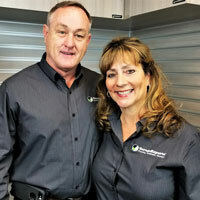 Local owners, Mark and Shelly Long, each have over thirty years in sales, finance, management, business and IT. The Longs have always been passionate about efficiency, design, and organization. They welcome the opportunity to help you create a beautiful and functional garage that you can be proud of. At Garage Experts of SW Missouri, we will work with each customer to customize their own unique solution and personalize your garage to suit your needs and taste. We look forward to meeting with you and crafting the ultimate garage makeover experience. Call us today to schedule your Free estimate. We’ll provide a custom 3D rendering of your new garage, complete with epoxy flooring, custom cabinetry, slatwall, and overhead storage. All products are manufactured in the USA. We provide a quality, professional look and superior product you won’t find anywhere else. We are so confident you will love your new garage, we offer a Lifetime Warranty on the Garage FX flooring system and on all of our custom cabinets. When you choose Garage Experts of the Southwest Missouri, you are supporting a veteran owned, local small business in your community. By working directly with local owners you can rest assured that we will provide the best in service and satisfaction with all your residential or commercial flooring coatings and garaged storage cabinetry. Every GarageExperts location is independently owned and operated – most by people who live within the community they serve. Each quarter, GarageExperts evaluates every location on the strength and quality of services they provide and recognizes those locations that consistently provide an excellent experience. Gold badges are issued to those locations that rank highly in number of installations completed with high customer satisfaction. When you’r;re choosing a Gold GarageExperts location, you’r;re getting excellent service, support and products throughout your garage renovation. "The Leading, Lifetime Warranty, Epoxy Floor Coating, Cabinet And Organization Company." Your local GarageExperts professional will transform your garage into a long-lasting and usable space. Bright, attractive, durable and easy to clean. Our wide selection of finishes will free you from the hassles and worries of peeling, chipping, stains and spills. GarageExperts industrial Epoxy & Polyaspartic Floor Coatings are bright, durable, easy to maintain, customizable to fit any brand standard, and compliant with all worker safety regulations. GarageExperts offers a wide variety of Commercial Epoxy & Polyaspartic floor coatings for virtually any application. GarageExperts of Southwest Missouri is your local garage makeover expert. View some of our recent work. GarageExperts® is a national, vertically integrated provider of quality garage cabinets, epoxy floor coating systems and organizational products. We provide value to our Franchise Partner and their customers, by offering the largest variety of product choices and solutions all backed with a lifetime warranty. Each location is an independently owned and operated franchise of GarageExperts® International, LLC. None of the communications made through this web page should be construed as an offer to sell any “GarageExperts” franchise in, nor is any such communication directed to, the residents of any jurisdiction requiring registration of the franchise before it is offered and sold in that jurisdiction. No “GarageExperts” franchises will be sold to any resident of any such jurisdiction until the offering has been exempted from the requirements of, or duly registered in and declared effective by, such jurisdiction and the required Franchise Disclosure Document (if any) has been delivered to the prospective licensee before the sale in compliance with applicable law. If you have any questions concerning the registration status of “GarageExperts” franchises in your jurisdiction, please contact us. ©2019 GarageExperts®. All rights reserved.